The air force's permanent tasks is to employ air capacities for emergency preparedness nationally and internationally. Central mission is continuous surveillance of airspace and Norwegian fighter aircraft readiness, sea surveillance with P-3 Orionfly, rescue service with the Sea King helicopters and helicopter support to the coast guard. While air surveillance in its nature is nationwide, the other operational capabilities to a greater extent a focus on the northern regions, particularly combat aircraft, maritime surveillance aircraft and Coast Guard helicopters. Along with the air force's Educational, inspektorat Air operational Inspektorat and National Air Operation Center make up the General Inspector's staff the air force's management a separate budget and score responsible Department. The air force's most important deliveries to international operations in 2014 was to provide personnel to the international airport in Kabul in Afghanistan and a transport aircraft in support of the effort against the ebolaepidemien in Sierra Leone. The air force's contribution to the international the airport in Kabul was completed in the middle of January 2015. The Royal Norwegian Air Force utilizes modern capacities such as F-16 fighters, Bell 412 helicopters and more, and has a strong focus towards international operations. Since the year 2000 the Royal Norwegian Air Force has participated with helicopters, F-16 fighters and C-130 cargo planes for operations in areas such as Bosnia- and Herzegovina, Kosovo, Lithuania and Afghanistan. P3 Orion Surveillance planes have also operated out of Italy in order to patrol the Mediterranean (Operation Active Endeavour). Peacetime force is approximately 1430 employees (officers, enlisted staff and civilians). 600 personnel are also serving their one-year national service. The mobilization force is approximately 5500 personnel. The Air Force consists of 7 air stations, 2 CRCs (Control and Reporting Centres), 2 educational centres, 10 squadrons with aircraft and helicopters and 2 surface-to-air missile battalions. The Air Force as of 2002 had 58 F-16s, six medium and ten short range ground based air defence batteries, six transport aircraft, 18 tactical helicopters and six maritime patrol aircraft. During the 1990s, the downsizing was targeted toward fighters and ground based air defence. The termination in 2000 of the planned procurement of new combat aircraft to replace the F-5 fighter aircraft and the lost F-16s has gave the defence procurement authorities somewhat greater freedom of action for a time. The updated F-16 in service would, however, require replacement in the longer term. The support aircraft and helicopters have been maintained at the same level. Reduced readiness and base closures cut active personnel from about 9000 to 5000 over the ten years. Towards 2005, the air bases structure and the ground based air defence batteries were further reorganised and reduced. The number of reserve personnel was to a large extent constant to enable mobilisation of civilian airfields for allied reinforcements in times of crises and war. The Air Force had [as of 2010] 57 F-16 fighters, 6 NASAMS (Norwegian Advanced Surface-to-Air Missile System) batteries, 12 Sea King Search and Rescue Helicopters, 6 P-3 Orion maritime patrol planes, 6 Hercules C-130 transport planes, 6 Lynx coastguard helicopters, 18 Bell 412 helicopters and 3 DA-20 Jet Falcon electronic warfare planes. Each air station has an air wing and a logistics organization. The air wing runs the operational activity - the heart of the Air Force. The stations and the logistics organizations offer infrastructure and support to the air wings to enable them to perform their operational tasks. The Control and Reporting Centres monitor Norwegian air space, and are a part of NATO's air monitoring service. The education centres contribute to enhancing the educational and experience level in the Norwegian Defence and the RNoAF. 717 squadron with support functions are moved while backing up to Gardermoen. Base defense battle group and Base defence tactical school on Rygge is moved to Ørland. air defence battalion and air defence tactical school in Bodø is moved to Ørland. National air operation centre is created and co-located with the military's operational headquarters at Reitan. 137 air wing while backing up is down, and flight departments on RYGGE was subject to the 139 air wing Bardufoss. Airport operations on Rygge is transferred to Rygge Airport AS. On 28 March 2008 the Government presented the new long-term plan for the Armed Forces: A Defence for the protection of Norway's security, interests and values. Based on the current long-term plan for defense sector the Inspector General for the air force has prepared a comprehensive restructuring plan for changing the base and organizational structure. In the realignment to the air force continued the breadth of today's capacities and further develop them organizational and through investments in new materials and new systems technology. Key of the air force's decision to acquire the F-35 aircraft. Other key changes include modernization of the air command and control structure and the phasing of maritime helicopters. The air force published a revised edition in the summer of 2014 by the General Inspector's plan for restructuring of the air force 2013-2025. The revised plan had the main focus on the period 2015-2016. 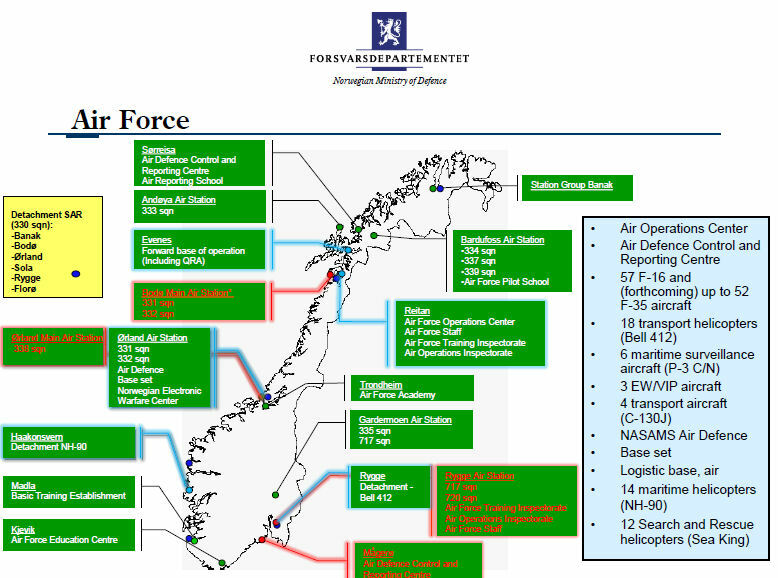 From May and through August 2015, the Royal Norwegian Air Force guarded Baltic air space. The Baltic nations Estonia, Lithuania and Latvia have all been members of NATO since 2004, but because of limited own capacities, the Alliance handles the air policing in the Baltics. This means that the other NATO partners alternate on maintaining the Quick Reaction Alert (QRA) in the Baltics. On 01 May 2015, Italy handed over the QRA responsibility at Šiauliai Air Base in Lithuania to Norway. Even though Norway has the main responsibility, Italy will still support the allied operation. In addition, the United Kingdom contributes from its established Ämari Air Base in Estonia. Belgian F-16 fighters placed in Poland support too. The mission lasted through August and involved four Norwegian F-16 fighter jets, of which two were constantly ready to act.